It’s Turkey/Chicken Soup time! Use up that leftover turkey bones. 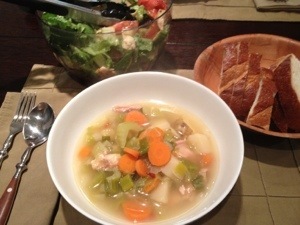 This chicken/turkey soup recipe is so delicious and fantastic. You can make the broth from scratch (which is what I’ve done here) or use a pre-made broth (if you already tossed the bones). I also gather up all my leftover vegetable parts that I usually compost to add to the broth while it’s boiling like onion & garlic & ginger peels/skins, vegetable ends from the carrots, celery, zucchini, broccoli, etc. Make the broth by adding in all the ingredients to a large stockpot or saucepan. Bring to a boil. Reduce heat and allow to simmer, uncovered, for 1 ½ hours. Strain the stock and save the broth for the soup. 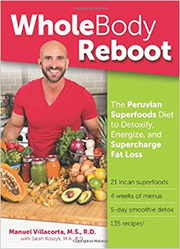 Makes 6 cups broth. You can save this for up to 3 days in the fridge before making the rest of the soup. While the broth is cooking: In a large pan on medium heat, spray with a cooking spray and cook the garlic and onion for 4 minutes. Add the potato and cook for 8 minutes. 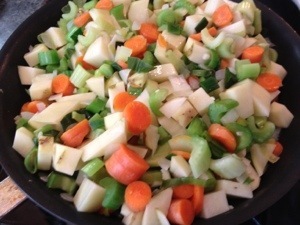 Add the carrots and celery and cook for 5 more minutes. 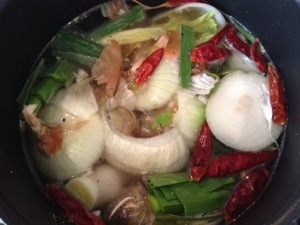 Once the broth is ready, add the cooked vegetables to the broth in addition to all the remaining ingredients. Simmer for 30 minutes for all the flavors to combine. Truly hearty & homey. Enjoy! Chicken Soup is the absolute best when you are feeling a bit under the weather. It buoys the soul as well as the filling the tummy! This is delicious – I especially like the addition of fresh grated ginger. Thanks! Ginger is so great and offers so many amazing benefits such as anti-cancerous benefits, reducing nausea, reducing congestion, and reducing joint pain! Making your own Crock Pot Beef Stew RecipeVegetables- I prefer fresh veetbagles over canned or frozen but you can use whatever kind you like. You can use your favorite veetbagles like potatoes, carrots, peas, beans, green beans, snap peas, celery, onion, sweet potatoes. You choose.Beef- I normally get the cheaper cuts of beef because it all will be tender and delicious in the end anyways. But you can choose which ever pieces you like.Base- There are many different kinds of bases you can use the possibilities are endless. Here are a few to help you decide. Any kind of beef based soup, gravy, beef broth, cream of mushroom soup, cream of celery soup, water etc. etc.Seasonings- Spices and herbs should be added in the last hour of cooking because over a long cooking period they will die out. Some ideas for seasonings for your crock pot beef stew recipe are salt, pepper, paprika, garlic, a tablespoon of soy sauce or Worcestershire sauce, basil, oregano and parsley.Cooking and Placement- You want to put all your hard to cook veggies like carrots and potatoes on the bottom and around the wall of the crock pot.The chunks of beef need to be placed in the middle of the veggies. The easy to cook veggies can be placed on top of the meat.Whatever base you decide to use should be poured in the crock pot now. If you are using something that’s very thick you will want to mix some water in with it in a bowl then pour it in the crock pot.For safety reasons you should turn the crock pot on high for the first hour then turn it on low for 7 to 9 hours. Good Luck with your very own beef stew recipe.